Mark your calendars: In 2025, Roman Catholics and Eastern Orthodox Christians may return to Nicaea, the spot in modern-day Turkey where Christianity was literally defined. In 325, early followers of Jesus came together to figure out what it means to be a Christian; the goal was to create theological consensus across all of Christendom. This was way before the faith sub-divided into East vs. West, Catholics vs. Protestants, Southern Baptists vs. Primitive Baptists—these were the early days of the religion, when it still seemed like it could be observed as one, united faith. The council’s effect on Christianity was huge; for one thing, most Bible-school students still learn some version of the Nicene Creed, the profession of Christian faith. On his way home from a meeting with Pope Francis in the Holy Land, Patriarch Bartholomew I, the primary leader of Eastern Orthodox Christians, gave an interview in which he said that he and Francis are planning a gathering in Nicaea 11 years from now “to celebrate together, after 17 centuries , the first truly ecumenical synod.” That’s a pretty big deal; in 1054, theological disagreements led to a schism in Christianity, which is how Roman Catholics and Eastern Orthodox Christians became separate faith traditions. This is a call back to a time before the schism, before the fundamental disagreements that kept popes and patriarchs from talking to each other for more than 900 years. “It’s 12 years away,” he pointed out. Trying to predict what will happen in 2025 is like an extreme version of confidently declaring who will be president of the United States in 2016—there’s just no way to know. Plus, Francis and Bartholomew are both in their 70s. Bartholomew said the pair wanted to leave this council “as a legacy to ourselves and our successors,” which seems like an acknowledgment that they could both be dead—or retired—11 years from now. There’s also the challenge of getting Catholics and Orthodox Christians on board for whatever they want to do. “If the pope wants to do this, the Catholic side will be lined up, but if the ecumenical patriarch wants to, some will come and some will not,” Palmo said. Bartholomew is the archbishop of Constantinople, meaning that he is “the first among equals” in the Eastern Orthodox churches, but he doesn’t have power over other patriarchs. And besides, Palmo said, Francis still has work to do at home—for example, his synod on Catholic doctrine on the family, to be held in October. “He’s got to pull this synod off first—his successor can roll back anything, which is why he is taking his time,” Palmo said. 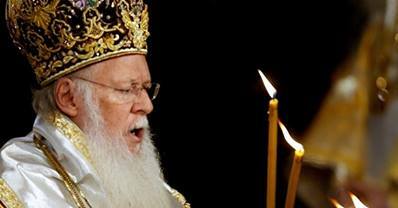 The Ecumenical Patriarch Bartholomew of Constantinople, the point of unity among Eastern Chrsitians, has called the patriarchs and archbishops of the world’s Orthodox Churches to a meeting in Istanbul in March. This meeting is a precursor to a Pan-Orthodox Synod slated for 2015. Orthodox Primates last me in Constantinople in 2008. The Ecumenical Patriarch is 74 and has served the Church as a priest since 1969 and in this present capacity since 1991. He is the 27oth successor of Saint Andrew the Apostle. His Holiness’ biography is here. All the holy Apostles, pray for the Primates! Many Protestants are facing the interesting but difficult choice between Catholicism and Orthodoxy. I’ve been getting to know some Orthodox guys via the blogs and facebook lately and have grown in respect for Orthodoxy from them. For Protestant Americans and Westerners in general, Eastern Orthodoxy looks appealing for many reasons. I leave aside in this post the ultimate determination of whether Orthodoxy is indeed the true Church (with the Catholic Church in schism from it) or vice-versa. Instead, I want to focus on what I see as Orthodoxy’s appeal agnostic of whether it is what it claims to be. 4. It’s a bit less strict morally. 6. It’s got strong community. I know several people who have considered or are considering Orthodoxy, often alongside Catholicism as the only alternatives to more aimless drifting in the sea of Protestantism. Many express their frustration that after working so hard to figure out that Protestantism is fatally flawed, they have two options still to choose from instead of one. That’s just one more reason why we need to heed Christ’s call to perfect unity in John 17 and heal the schism.